This week’s blog is part 1 in a 3-part series covering how the updated CWI Pre-Seminar can benefit specific groups of people. Today we’ll focus on those we call “Hopefuls.” These are people who have decided to take the CWI exam for the first time. If you’re unfamiliar with the CWI Pre-Seminar, or aren’t up to speed on the new changes, be sure to check out our last blog. So, you’ve decided to take the next step and become a CWI. If you were to ask a handful of current CWIs to give you their thoughts on the certification exam, you’d likely encounter a common sentiment: it’s no cakewalk! That should come as no surprise, given the degree of knowledge and experience that being a CWI requires. 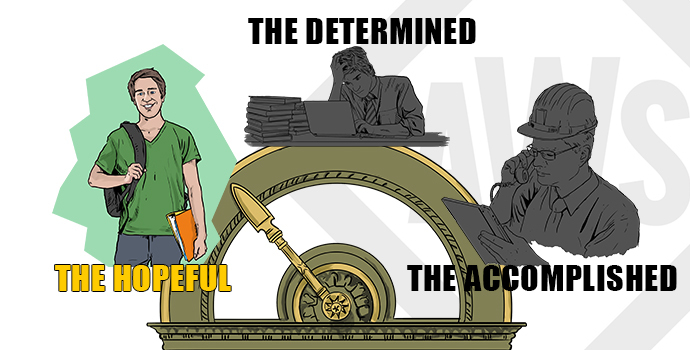 As a CWI hopeful, you may find yourself getting increasingly anxious as test day inches closer. This is normal, but you must make sure that your level of focus and preparedness keep pace. I’m Focused! But How Should I Prepare? Well, most prospective CWIs opt to participate in the 5-day instructor-led seminar and then take the exam immediately after. For many, the live seminar proves to be a significant difference-maker. But it’s important to understand what the seminar is really designed to do: prepare you on how to best approach the exam and apply your knowledge on welding inspection. The live seminar isn’t meant to simply teach you every last bit of information that is covered in the exam. If you’ve scoured the Body of Knowledge for the CWI exam and identified some topics that you’re rusty, or totally unfamiliar, with, then you shouldn’t expect that to suddenly change just by attending the live seminar. With that said, don’t start hyperventilating! 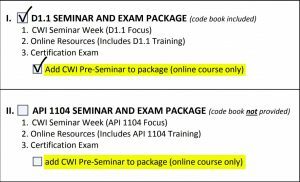 If you want to better prepare for the exam, the updated CWI Pre-Seminar is a great option to shore up some of those weak spots. The Updated CWI Pre-Seminar, you say? 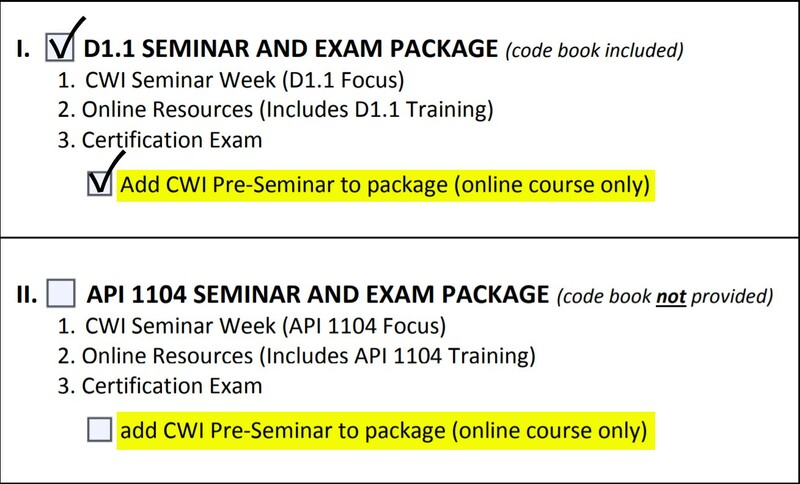 The CWI Pre-Seminar is the best way to gain access to tons of fundamental information that will help with Part A of the exam for a great price (more on that later!). As stated in our previous blog, AWS Learning modified the courses line-up for the Pre-Seminar based on feedback from students and instructors. The new additions give you content that better aligns with the CWI body of knowledge. Several, in fact. The newly-added Welding Fundamentals II covers resistance welding, plasma arc welding, electron beam welding, and laser beam welding & drilling. These all fall under the topic of “Welding Processes”, which makes up at least 10% of the questions in Part A. Welding Fundamentals III covers brazing and soldering, which are also covered in the exam to some degree. Another benefit of the new Pre-seminar is that the newly-included material covers some of the topics tested in greater depth. For example, while Welding Fundamentals I, which was always in the Pre-seminar, covers safety, you now also get an entire course dedicated to Safety in Welding. This Sounds Great! How Do I Take Advantage of the New Content? Simple! You have two options. Don’t forget to check the box! When you go to the CWI Seminar & Exam landing page, you need to click on the initial application. Box number 4 allows you to choose your package option. If you’re interested in the Pre-Seminar, either check off option I or II based on the code you want to test to, and check the box next to “Add CWI Pre-Seminar to package (online course only)”. How Much Does the Pre-Seminar Cost? The CWI Pre-Seminar is specially priced at $750 until July 6th! Though this was mentioned in our last blog, it bears repeating that the standard price of the CWI Pre-Seminar for AWS members is $865 and $1150 for non-members. Everyone likes saving money, and the best detail here is that the $750 price is 40% lower than it would be if you bought these ten courses individually! I reviewed all the Pre-Seminar content. I’m still nervous. Now what? There’s no doubt that the CWI exam can be intimidating. All the material we’ve been discussing serves to help with just one part of it! Breathe easy, because AWS has your back! There are several AWS blog entries that go over how you should prepare for the CWI Seminar and exam. If Part B is stressing you out, you could always order an inspection toolkit in U.S. customary units or metric based on where you are planning to certify. Taking time to familiarize yourself with these tools will help immeasurably on exam day. AWS also has many resources to help you better understand your chosen codebook for Part C of the exam. Of note are the three online code clinics for D1.1, API 1104, and D17.1 respectively. In each one, a subject matter expert guides you through the material and gives you strategies for effectively searching the code on exam day and beyond. In previous blogs, we shared the results of fruitful Q&A discussions we had with the instructor that teaches the D1.1 Online Code Clinic and our API 1104 Online Code Clinic instructor. In these blogs, they answer questions that you probably hear all the time, like “Why is the CWI exam so hard?” and address general misconceptions about the CWI test-taking process. With Great Preparation Comes Great Results! While no one can guarantee that you’ll pass the exam, it is AWS’ sincere hope that our educational content, including the new Pre-Seminar, will help you realize your full potential and move on to the next phase of your career!